A long time ago we posted a brief how-to on creating Ubuntu / Debian .deb files. If you don't know how to create a .deb file, you still need to read that how-to (I also strongly recommend you read the Debian documentation), but Debreate will help you create debs faster. 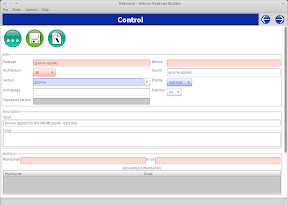 Debreate has a field for most of the info in the files that go into the "debian" folder (the "debian" folder is where all the packaging files reside) so it should be both faster and easier to create a Debian package. But like I said, that doesn't mean you can skip reading the documentation. Download Debreate/ (comes in an Ubuntu / Debian .deb) - I recommend downloading version 0.7 even though is still alpha, because it comes with more features (it is marked as "alpha" because not everything planned was implemented in this version).